Here’s a new toy I have just brought. 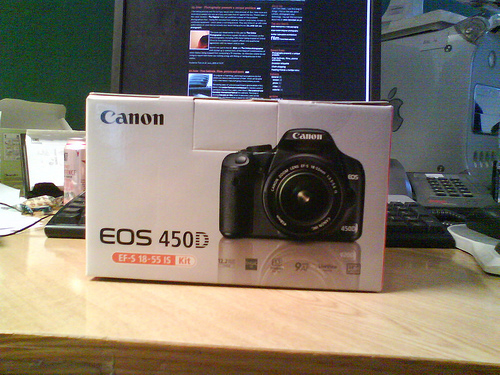 I already have a Canon SLR but mine is slightly older, (a 400D) and this is brand new. It is also not for me, but for my sister. Needless to say I am jealous. The kit lense has image stabalisation, the camera has spot metering and live view, and it has a larger and brighter view finder. I made the purchase in Jessops, which I will try to never do again. Chain store fever struck again. It was frustratingly difficult to just buy a camera. No i don’t want extra insurance, or a bag, or a rip off memory card (£38.99 for a standard 4GB memory card? Ridiculous. ).